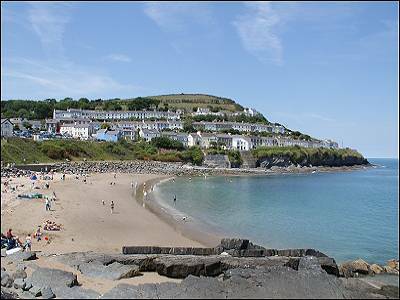 Powys 4 Luxury caravan, Quay West - sleeps 6. Powys 4 is a centrally heated, double glazed Swift Bordeaux. There is side decking and a small front deck with outside furniture. Powys 4 has 3 bedrooms - one double and 2 twins. There is an open plan sitting / dining room with large flat screen TV, and a well equipped kitchen. Regret no pets. This is a Swift Bordeaux Exclusive 38 x 12, 3 bedroom caravan, with full central heating and double glazing and a timber deck with outside furniture. There is a double bedroom and an en-suite WC and wash basin with 22 inch wall mounted TV with integrated DVD player. There is a family shower room with a large glazed shower, WC and wash basin. The very well equipped and spacious kitchen has ample cupboards and has a full size gas hob, grill and separate oven, microwave, kettle, toaster and large integrated fridge with 3 drawer freezer under. There is an open plan dining area which seats 6, and large living room with 2 free standing sofas plus additional seating , a flat screen 42 inch TV and DVD player and a flame effect wall mounted electric fire. French doors open out onto the fully enclosed and gated deck with patio furniture with parasol at the side of the caravan and a bistro table with 2 chairs at the front. There are steps up to the deck. There is off road parking for one car beside the caravan and additional parking areas nearby. Prices inclusive of all electricity and heating. Bed linen is not provided. All duvets and pillows to sleep 6 are in the caravan. Parking for one car and additional parking areas nearby. To enjoy all of the park facilities, pools and entertainment in the evening, passes or activity packs can be purchased at reception on arrival at the park. 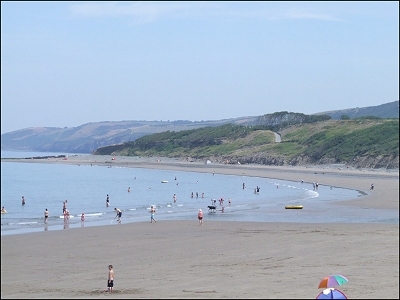 Local Amenities - Beach, scenic coastal walks, Water sports Centre, Bass fishing, fishing and Dolphin watching trips available from the harbour, pubs and restaurants including 3 seafood restaurants an Indian and a Chinese take away, Farm Park and National Trust property at Llanerchaeron, near Aberaeron.